You know that Long List of Things to Do in 2016 that I posted the other day? Well, I left off one little thing. Well, actually…I left off several little things. I left them off on purpose, because I thought they weren’t really worth mentioning. But the more I think about it, the more I realize that these little stitchy things have given me a lot of pleasure lately – more so, perhaps, than any of my larger projects. See, my larger projects – the projects that you see most frequently on Needle ‘n Thread – require me to traipse out to my workroom, to work in isolation in a rather lonely, cold environment, under glaring lights, sometimes using magnification, never in a really comfy chair, always with a certain level of concentration, always with a camera handy, always thinking about the article that will accompany the photos, always planning next steps… you get the idea. But I have a collection of tiny little kits that provide me with just the opposite experience. They are my secret little indulgence. Mill Hill, the company behind a lot of the little beads you see at local needlework shops and craft stores, produces a line of tiny little cross stitch and bead embroidery kits that are worked on perforated paper. In fact, they produce a whole slew of them, in all kinds of styles, for every season. And they are my guilty pleasure. They’re fun, colorful, easy to work. I can work them at night in my living room, cuddled up under a quilt on the couch or in a comfy chair while I indulge in another guilty pleasure (any BBC drama or mystery series – heh heh). They give me something to do with my hands, but they don’t involve a lot of concentration. They don’t require massive amounts of light or any magnification. I can socialize with other people while I’m working on them. I don’t have to pause for photos. In fact, I don’t even bother having a camera around when I’m playing with them, unless it’s my phone camera. When I’m not working on them, they tuck right back into their tiny ziplock bag and can be squirreled away anywhere, without taking up any room. And while I don’t have any specific plan for them when they’re finished, I know I can make use of them in a variety of ways. They can be mounted on a greeting card. They can be made into a Christmas tree ornament or a bookmark or just a little token for a friend. And when they have little elements like frogs on them – better yet, frogs tucked into a colorful pair of Wellies (which is another little obsession of mine – I love Wellington boots!) – they can’t help but cheer you up! These little Mill Hill bead and cross stitch kits come with everything needed to complete each little kit (except scissors), including beads, floss, perforated paper, needles, specialty buttons or charms, chart and instructions. They’re packaged in little ziplock bags for easy storage and transport. If you like tiny projects that are colorful, ornamental, quick, fun, and easy, you should look them up! I find them rather therapeutic after a day of concentrating on other types of embroidery. I generally buy little kits like this through Nordic Needle, but just about any local needlework shop that focuses on cross stitch will carry at least a few of them. Some projects are larger than others, some involve Aida cloth instead of paper. But my favorites are the tiny little ornamental pieces that are done on perforated paper, as they’re so easy to hold and usually pretty ingeniously cute. Right now, with winter upon us in Kansas, I really like the Spring Collection kits that are flowery and bright. You’ll find all kinds of garden-themed little ornaments in the Spring Collection, from the Wellies above, to a flowery watering can, butterflies, lady bugs, Easter eggs adorned different ways, and so forth. And if you can find it somewhere, there’s an adorable tropical fish kit that shouldn’t be passed up. It’s too bad they don’t do a whole series of tropical fish – they’re super fun! Yep. My Guilty Pleasure. 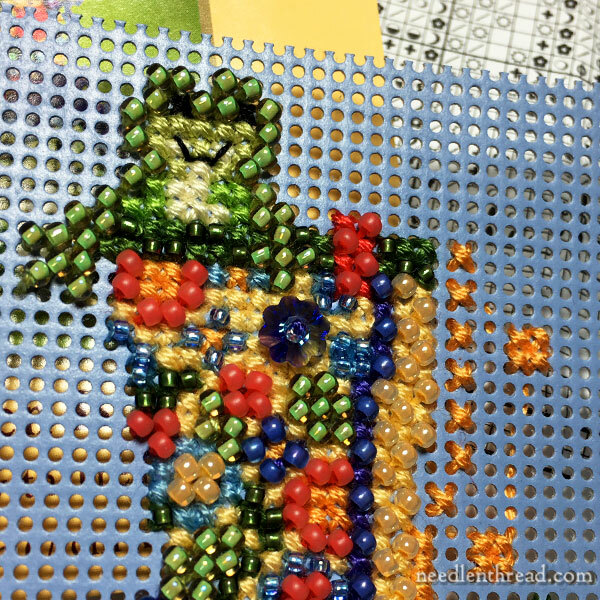 Now you know how I’ve been spending my evenings lately – beads and BBC. Well, we all have our little secrets, don’t we? I love to curl up also sipping hot apple cider or hot cocoa while Midsomer Murders on Netflix (my fav BBC mystery show) or Keeping Up Appearances ( my fav BBC comedy). I have watched them from show 1 to the end several times over. No commercials! I have a couple of those little kits too. Enjoy! I love little projects, something that there is a short time line to finish if you need that sort of feed back. And usually there is plenty of opportunity to add and embellish however much you desire. They give you opportunity to try something or try new stitches without being committed for life. I have done enough big projects for myself and all family members so these keep me stitching. And yes I have a Mill Hill kit too. I think Wellington boots are great too. I guess they make one think of a beautiful English countryside, with cottages, gardens and tweed coats. Have you looked at Ann’s Orchard needlework site? She has small, beaded embroidery kits, with some lovely little birds. Oh, yes, I’ve seen her shop! I really, deep down, am tempted by her clutch purses. But the exchange rate makes them a bit dear. She las lovely stuff! Stay warm there in Kansas…I used to live near Lawrence and my Dad was from Moran. Pretty state, but awfully long winters. Oh my goodness. Thank you for this. It’s so easy to get the impression from the professional embroidery sites and blogs, like yours, that everything you do is a gorgeous and original work of art. I guess it’s kind of like the instagram effect for models or lifestyle bloggers, it always looks so perfect. Knowing that someone at your level also works with tiny little kits (still gorgeous and beautifully done) makes me feel much less conflicted about all of the unoriginal embroidery work I do from patterns and kits too! Plus, the frog is adorable. I’m going on a trip next week, and I bought several little metal sleds that have perforated-paper cross-stitch panels applied to them, for Christmas decorations (at art needleworks). I’ve secreted the paper (not the sleds) and some DMC thread in a little ziploc bag for the plane and for idle moments while traveling. I love little kits! Are they the little sleds from Keepsake Needle Arts? yes! I received one as a gift years ago and love it, so I decided to make some of my own. I’ve been eyeing them for awhile. Oh, I might as well just give in and order the kits, lol! I used to do little kits for Christmas Decorations but haven’t done one for years. I’ll have to go find some to do while watching the next series of the BBC’s Poldark. It will need to be something very simple as I won’t be able to look away from the TV screen for long! Oh, that Aidan Turner! A handsome devil who is far too young for a woman of my age! I remember one year I did a whole packet of Christmas decorations, worked on plastic perforated material. They weren’t difficult but by the end, I found I’d worked myself to a standstill on these small kits. I’ve never done any since; I guess I pretty much OD’d on them. Now I horde stacks of giants projects to do. So your secrets out for all the world to know, still at least it’s something as nice as embroidery and BBC nothing better. Are you watching War & Peace which started 2 weeks ago very good. The nice thing about these kits apart from being easy to transport anywhere is that you can purchase them in the UK at Sew & So which saves the cost of shipping and they have a good selection as well great news. Thanks for the information on these kits I didn’t know about them, they look very inviting. Your post makes me chuckle over my evening dinner. I love Mill Hill kits too and have stitched quite a few over the past years. However, at the moment I am stitching Easter Bunnies on plastic canvas. The kit was given to me by a friend who thought that, since I embroider, I would love them. And indeed I do! For exactely the same reasons as I love the Mill Hill kits. After a day of slaving away on my Appenzell sampler, I need something to relax with (I am going to Appenzell tomorrow! So wish you could come too!). And after watching through all 20 Seasons of Time Team, including all the special digs, I am now hooked on the BBC’s documentary channel on YouTube. It is brilliant! As are my bunnies :). I love Mill Hill kits and have stitched many of them over the years. I could spend a fortune on them. After I read this I had to go looking for the fish. I went to the Wichelt site (http://www.wichelt.com/) and found it there. I think I might have to order it. Search MH181610 and there’s a series of new seasonal kits including the fish! I like the fireflies and the sea turtle as well. I know exactly what you mean, Mary, when you stitch with an outside purpose that goes along with the project. My easy chair is not even in my work room and used only when hand stitching is required, which is very seldom in the fashion industry nowadays. Those special indulgence projects live only in my dreams lately, waiting for “someday”. Hope you are feeling well these days and recovering speedily. I love these little Mill Hill kits, for all the reasons you mention, Mary. Nice to see you feature them. I hope you are feeling well! Sending love. Mary I love these little kits too. I have stitched over 100 of them. I hang them in the window panes of my house depending on the season (Easter – I have an Easter tree too that has some really tiny ones that hang on the tree, Christmas, Halloween, Valentines, etc.). They are fantastic little kits to have tucked into your purse to pull out when waiting at the doctors office, to collect my kids from school or the bus, or waiting just about anywhere. Beads and BBC – doesn’t get much better than that! These days most of my stitching is on small pieces. I love the Mill Hill kits and have for years and years! I’ve always carried around a little kit in a zip bag in my purse so I’m never caught without something to stitch if I’m stuck waiting somewhere. And I can’t count the number of strangers, especially kids, who’ve helped me make a few stitches in whichever little bauble I’m working on. Same here! I have my little stitch bag with me anywhere I go, and it easily fits my tools, a bead mat in a tin, and a couple of the MH kits. Easy peasey! Oh dear, now look what you have done. I’ve just had a coffee and looked at Nordic Needle. Those little bead kits are gorgeous – I have never seen them before down here in Australia. An order will be heading to Nordic Needle I think. A new Obsession, Oh Mary, as if I need it! He he! 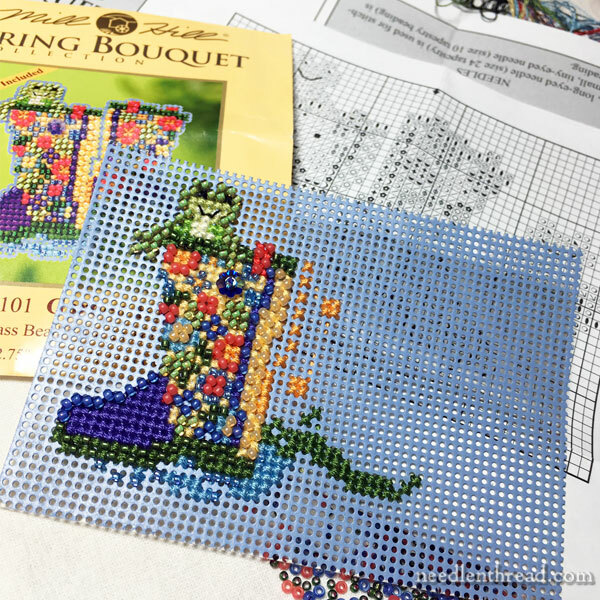 Thank you Mary – I love flower fairies xstitch kits to relax but always feel I should be doing my other larger projects so your article today released me. I’ve been watching Hinterland from the BBC; its set in West Wales. I love it; the scenery is bleak but beautiful. Each day I take the Arriva Wales train that heads to Aberystwyth where the series is set – but get off on in industrial Midlands – one day I plan not to get off! I absolutely agree. The difference between a cozy kit that you can put in your purse and do in a park and one that requires lighting and equipment is vast. It’s lovely to have both on the go. My guilty secret, since we are into the big reveal it seems, is that I do all my embroidery while watching TV – and yes, mostly that is either Australian or BBC made dramas (Midsomer is one of my all-time faves too). Sometimes I do it while sitting in bed and sometimes while sitting on the sofa. In my defence I do have physical disabilities which limit my mobility and my bed is the most comfortable place in the world for me. But kits, not really, I would prefer to make my own designs. I can really relate to this! I search out mini kits to do on trains, whilst having coffee out etc, I always have at least two in my handbag. At home I always stitch with a magnifier and for holidays I take a small clip on one with me, but when just out and about, I love minikits on low count linen or even aida so I can easily see on a moving train or where light is not so good. A couple of questions: I bought several Mill Hill bead kits last year. I put them away because i had trouble with the beads. This is the first time i am using a beading kit. Do you separate the colors in different containers or put them all together? What kind of containers do you use to hold the beads? Thank you for your help. They usually package the beads in two bags, so that similar colors are separate. I keep them in those two group. I’m just using the lids of some small jewelry type gift boxes to keep the two groups separate. My sister made a few of these for both of us, and they work really well because the beads stay still while I hunt for them. If I worked out of the bags, my parrot would start picking up some very bad language from me. Mary, it’s funny you bring these up, but since Christmas, I’ve been a Mill Hill bead kit machine and have finished seven of them. They’re perfect when I want low stress or am not feeling too intelligent. After I cut them out, I whip stitch along the edges with a complementary floss from my bag of “extras”, and it looks so much nicer than perforated paper. OK, now I am addicted too. I ordered a bunch yesterday. I think they will be great for the dog park. I also ordered the Ann Orchard clutch with the peas. So cute! If you would like to make your own bags with your own designs, Martha Stewart has a great tutorial on U-tube. I think it is called the upstyle clutch, or the upcycle clutch. You can get the pattern online and also the purse frames. I prefer the ones that have the chain. Very fast and simple to do. I say feel no guilt on these! In the sewing world, no one expresses guilt over sewing something fast and easy during or after a long project requiring full attention to details. A little something to make you feel like you are getting something done, not slogging along on an endless project. Ah yes, I love little kits too and have done a number of Mill Hill ones in particular. The last one was Kris Mouse, and little mouse in christmas hat and pants with gorgeously cute feet. I made it into an ornament. I’ve been reading some of your older blogs, and really enjoyed your blogs on deconstructing goldwork. I got to the part about deconstructing the Agnus Dei, and it said the next part would be deconstructing the book. BUT I can’t find the blog on deconstructing the book! It’s not in the index, and I’ve clicked onwards a few from the blog on the lamb, but no luck. Can you point me in the right direction, please? The lamb one was written 29th March 2013. I agree, those kits are fun! I have not done one in quite a while, actually. For me, cross stitch is like comfort food — no decisions required at all. But, I still make counting mistakes when the tv is on, so I had to switch to simple stitchery or hand piecing. Anyway, enjoy your preview of spring! I love working the Mill Hill kits too, and also Stitch and Zip kits, as a break from my larger projects. Unfortunately, I have injured my left thumb and can’t comfortably hold stitching work in my left hand. I need the piece to go into a hoop or frame, and then mounted on my stitching stand. Has anyone out there ever tried mounting perforated paper projects to a stand?? The Mill Hill bead kits are my guilty pleasures, too! I absolutely love having a project I can just pick up & stitch without having to think or plan ahead! I always have a kit with me wherever I go – ya never know when you’ll have a few moments to stitch!!! As lovely as they are, I wonder about the longevity of the little piece – especially if beads are involved. Working on a paper base gets me wondering about all the work involved (even if it is a little piece) and what my time is worth. I’d rather take the design and transfer it to an Aida base or something more sturdy. Just my outlook on things. .You have been an inspiration to me for some time now. You are so talented. I haven’t seen anything lately about embroidering on a patterned fabric. I have an accent pillow for my bed in a lovely burgundy rose pattern. I’d like to enhance this piece with embroidery stitches. Is this possible? Or do you think I would be ruining a beautiful pillow? Thank you for any help. I’m praying for you everyday. This blog made me smile. I learned to embroider on perforated paper a very long time ago. Probably more than sixty years ago. I didn’t know it was still available. I still remember doing a cowboy on a horse with a lasso that became a bookmark. It was an ideal medium for a child. The design was printed on the paper and the grid of holes made it very easy to stitch straight. I hadn’t thought about that for a very long time. Thanks for jogging my memory.